The iconic graduation cap and gown symbolizes one cohesive group of students moving on to the next phase of life. Look your best at graduation by choosing the best colors, styles, and fabrics to represent your group's individuality. Shopping for graduation apparel on a group or individual basis can be simple when you know where to shop. There are three main ways to shop, each with its own pros and cons. Often, administrators or a school group will spearhead the shopping process making the parent and student responsibility as simple as placing a graduation cap and gown order. If you want to order in bulk as one group or involve a committee in the selection process, catalogs and paper order forms are the best option. Everyone will easily be able to see what's available, how each color looks, and compare styles quickly. You can tear or cut out pages and styles you like best for a simple side-by-side comparison then use these images at your informational table for parents and students. Since these companies don't need to pay for big fancy websites, you might also save a little money. Academic Apparel's Academic Cap & Gown department has a catalog you can request to see all of their cap, gown, cord, and stole products. Their standard "Keeper" package, which includes a gown, cap, and tassel, costs about $25. Since the company directly manufactures most of their products in the U.S., it takes about three to four weeks to complete production after you place an order then another week or so for shipping so plan to order well in advance. Catalogs like this are ideal for ordering all student's caps and gowns at once. While they also feature online ordering, Graduation Source offers shoppers a printable order form so group coordinators can help parents and students with purchases. A basic cap and gown set costs from $18 to $27 while a set with a diploma cover runs about $30. You can choose from 15 common colors in shiny or matte fabrics. Graduation coordinators can request a free cap and gown sample to show off the product, and then use the order form to buy caps and gowns for the whole class or school at once. Groups looking to streamline the buying process for families get the most out of online shopping. The graduation coordinator or a small committee can quickly pick colors and styles online, then many e-commerce sites will set up a specialized page just for your school featuring only the options you've selected. Parents can go online at their convenience and know exactly what they need to buy. Online shopping also offers the most room for customization. If quick and easy is what you're after, shop online at Willsie Cap and Gown. They offer three distinct lines of cap and gown packages. The One Way collection features a front zipper on shiny knit polyester fabric where you pick from 18 colors for under $20 each. The Executive collection is made from a matte woven polyester with matching front zipper and costs $20 each. Items in the Ultra Green collection are environmentally friendly as they're made from 100% recycled plastic bottles and come in your choice of ebony or green for $35. You can expect a quick turnaround time from this retailer with orders shipping out in about one week. Most packages include your choice of one or two tassel colors for the cap and a small charm with the graduation year. Sizes are selected by height and include the standard hem up nine inches from the floor. You may know them as one of the biggest class ring retailers, but Josten's also sells graduation apparel for all ages. Shop custom tassels or search your school's name to find cap and gown packages. Packages with a cap, gown, graduation tassel, keepsake tassel, and key chain cost around $100. If your school doesn't already have an account with Jostens, you can search for a local representative to help you build a custom online store for your district. Sometimes working with a salesperson is your best bet because he or she is readily available to answer any questions that come up throughout the process. Their job is to make sure you get exactly what you're looking for. If you're not sure what to look for in graduation attire, shop through a local company representative for the most helpful and personal experience. Chances are the sales rep can come to your school and provide all their information to parents and students making the ordering process much easier. Herff Jones uses local sales representatives to give you the most up to date and personalized shopping experience. Use their Rep Locator page to find a representative near you who can communicate over the phone and in person to fill your needs. This company offers caps and gowns for preschool through college graduates and faculty including modern customized attire featuring your school mascot. High school packages start at $25 to $60 each. Once you set up an account with your local representative parents and students can go online and search the company website by school to purchase. Graduation is one of the most photographed and memorable events in the high school experience. Help your school shine by choosing colors and styles that speak to your school's personal identity. Many schools choose to limit cap and gown colors to their two main school colors. This keeps the spirit of school pride alive throughout the momentous event. For a more traditional look, have all students wear black apparel or the same main color from your school colors. You can also have the girls wear one of your school colors and the boys wear the other. If you want a more modern feel, let each student pick their own color to give graduation a diverse look or let the senior class vote on a color that best represents them as a whole. Pairing one color robe with another color hat also gives a fresh look to the outfit. While most graduation outfits look similar, there are a few style choices you'll need to make based on the tone and location of your ceremony. 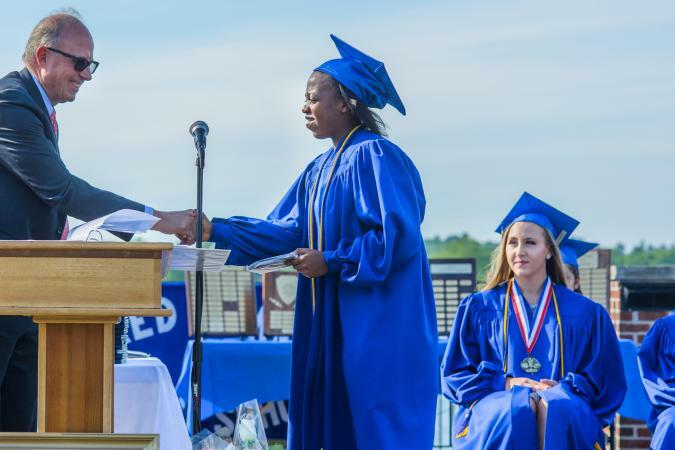 The end of high school can be expensive with graduation announcements, parties, gifts, attire, tickets, and planning for college or adult life. Many students and families aren't able or willing to spend a lot on an outfit they'll only wear for a few hours of their lives. If you're budget conscious, these savings suggestions look just as nice but won't break the bank. 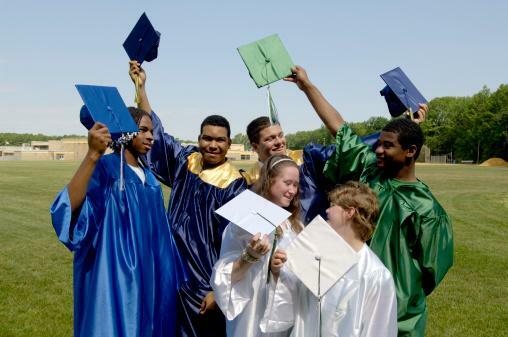 If your school houses a large population of low-income families, you may be able to get help from a local organization or school group to purchase cap and gown sets that can be reused from year to year. Look for local mini-grants where you can request funding for projects related to education. When requesting funds for such a purchase, be sure to include dry cleaning fees for each year. Since there are lots of one-size-fits-all gown and hat options, you'll be able to outfit graduates year after year. Schools can also collect donations from families who don't want to keep their gown for use by students who can't afford a new one. Buying used graduation attire can help you save a lot of money because these items typically cost at least half the price of new items. If you purchase a good-quality used item, there won't be any stigma attached because people won't be able to tell it's used. Look for second hand gowns and hats at local thrift stores, in local resale groups on social media, or larger resale websites like eBay. Examine the item in person or in pictures before making the final purchase and steer clear of apparel with faded colors or rips. Make sure the price is significantly lower than a new cap and gown. Ensure the color and style meet your school's guidelines. Choose a seller with a good return policy in case the actual product doesn't look like the photos. Instead of buying a robe you'll never wear or look at after graduation, consider renting one. You'll save money and offload the gown after you've used it. Since the robes can be laundered and the caps typically can't be, you'll probably still have to buy a cap. The best part about renting your apparel is you don't have to worry about cleaning or storing it. Graduation apparel retailers often offer rental gowns you wear then ship back to the company. Oak Hall Cap and Gown rents out 13 different colors of their poly-satin fabric caps and gowns for groups of any size. Call their customer service line at (800) 223-0429 for pricing information. U.S. rentals are available from Grad Goods & More in 13 colors like black, white, gold, and maroon. Packages include the cap and gown and you'll have to submit their online inquiry form for pricing information. On top of the robe or gown and cap, a graduation outfit can include small accessories that signify big achievements. In addition to being a well-known symbol of graduation, the tassel also plays an important role in the ceremony. When seniors enter the venue, the tassel is worn over the right side of the cap. At a designated time the new graduates move the tassel, so it is now hanging over the left side of the cap to signify moving on. Many teens keep this tassels as a graduation memento since it's easier to display than the whole outfit. Some students hang the tassel from their rear view mirror, tack it up on a bulletin board, or hang it in their locker during their senior year. Stoles are strips of fabric worn around the shoulders to signify special honors or membership. They hang down the front of the graduation gown and are usually made of a shiny, satin material. Stoles are used to identify students who have achieved honors or are a member of an organization. When stoles are intended as an honor, they are provided by the school, sometimes awarded at a separate honors ceremony. Stoles designating membership in an organization, like National Honor Society or Key Club, may need to be purchased by the student. Some clubs budget for the stoles considering them a gift to departing seniors and a thank you for their involvement. Cords are thick ropes worn over the shoulders of the graduation gown and left to hang down the front of the ceremonial outfit. Like stoles, cords are used to recognize honor students. They are selected to coordinate with the graduation cap and gown, often using school colors. For instance, if the school colors are black and gold, seniors are likely to wear a black gown with gold cords. Some schools also award medals to high-achieving seniors, such as the valedictorian or those receiving departmental awards. It is appropriate to wear these types of medals with the graduation cap and gown in recognition of a student's success. Graduation includes a lot of pomp and circumstance, but this is your time to shine and show off your accomplishment so you want to look your best. Use these shopping and dressing tips to put your best foot forward at the ceremony. Follow all school rules and dress guidelines so you'll be guaranteed participation in the event. 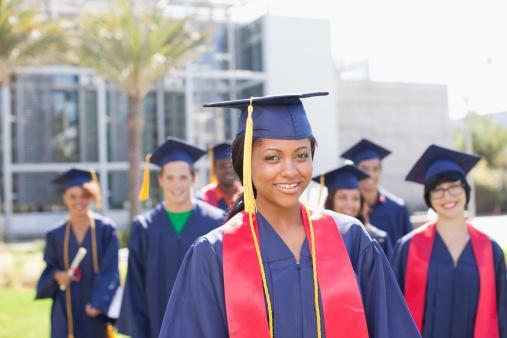 Dress in semi-formal attire under your cap and gown so you'll still look great before and after the ceremony. Opt for a nice pair of slacks and dress shirt or a nice dress. Wear comfortable shoes with a semi-formal style so you'll still look polished, but won't be prone to tripping up the steps or across the stage. Plan a hairstyle that won't interfere with the placement of the cap. For instance, a ponytail might make it sit too far forward. Girls can attach the cap to their hair with bobby pins. Dress for the temperature. Depending on your location, your late May or early June graduation ceremony may be pleasantly warm or sweltering. The ceremony may be outdoors or in an air-conditioned facility. Wear clothing that will be comfortable when layered with the graduation cap and gown. The traditional graduation cap and gown signify an important event in your life and help set it apart from the average day. Get the professional, celebratory look in a way that's inclusive of everyone when you take the time to shop around.